The Allies of World War II cooperated extensively in the development and manufacture of new and existing technologies to support military operations and intelligence gathering during the Second World War. There are various ways in which the allies cooperated, including the American Lend-Lease scheme and hybrid weapons such as the Sherman Firefly as well as the British Tube Alloys nuclear weapons research project which was absorbed into the American-led Manhattan Project. 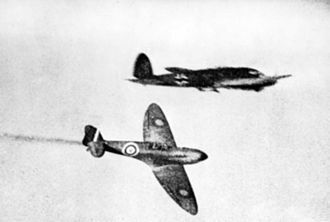 Several technologies invented in Britain proved critical to the military and were widely manufactured by the Allies during the Second World War. 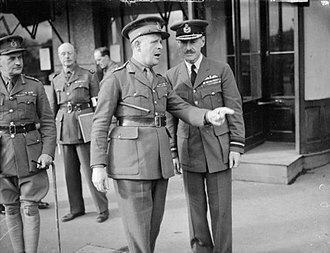 The origin of the cooperation stemmed from a 1940 visit by the Aeronautical Research Committee chairman Henry Tizard that arranged to transfer UK military technology to the US in case of the successful invasion of the UK that Hitler was planning as Operation Sea Lion. 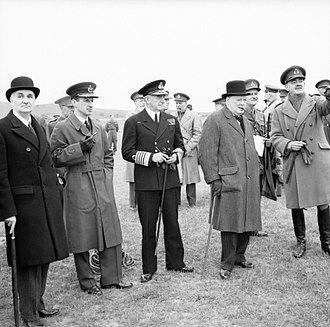 Tizard led a British technical mission, known as the Tizard Mission, containing details and examples of British technological developments in fields such as radar, jet propulsion and also the early British research into the atomic bomb. 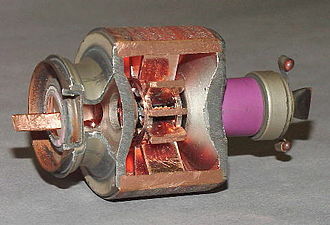 One of the devices brought to the US by the Mission, the resonant cavity magnetron, was later described as "the most valuable cargo ever brought to our shores". Another technology taken to the US, by Tizard, for further development and mass production, was the (radio-frequency) proximity fuse. It was five times as effective as contact or timed fuzes and was devastating in naval use against Japanese aircraft and so effective against German ground troops that General George S. Patton said it "won the Battle of the Bulge for us." The British supplied tanks to the USSR in the form of the Matilda, Valentine and Churchill infantry tanks. Soviet tank soldiers liked the Valentine for its reliability, cross country performance and low silhouette. The Soviet's opinion of the Matilda and Churchill was less favourable as a result of their weak 40-mm guns (without HE shells) and inability to operate in harsh rasputitsa, winter and offroad conditions. In 1942, a T-34 and a KV-1 tank were sent by the Soviet Union to the US where they were evaluated at the Aberdeen Proving Ground. Another T-34 was sent to the British. 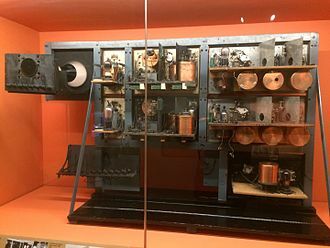 The British demonstrated the cavity magnetron to the Americans at RCA, Bell Labs. It was 100 times as powerful than anything they had seen and enabled the development of airborne radar. 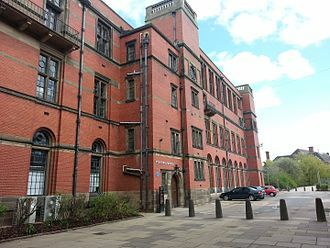 In 1942, and with the threat of invasion by Germany still apparent, the United Kingdom dispatched around 20 British scientists and technical staff to America, along with their work, which had been carried out under the codename Tube Alloys, to prevent the potential for vital information falling into enemy hands. 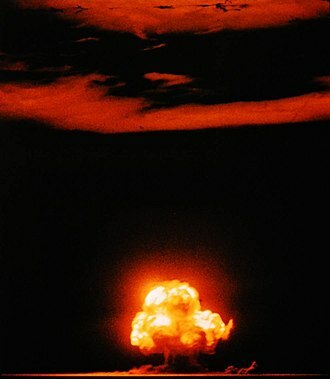 The scientists joined the Manhattan Project at Los Alamos, New Mexico, where their work on uranium enrichment was instrumental in jump-starting the project. 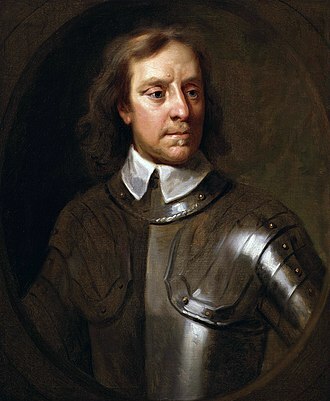 This collaboration eventually led to the Mutual Defence Agreement between the two nations, whereby American nuclear weapons technology was adapted for British use. Other technologies developed by the British and shared with the Americans and other Allies include ASDIC (sonar), SIGSALY, the Bailey bridge, gyro gunsight, jet engine, Liberty ship, RDX, Rhino tank, Torpex, traveling-wave tube, proximity fuze. ^ Roberts, Eric (16 March 2004). "British Technology and the Second World War". Stanford University. Retrieved 26 April 2015. ^ James W. Brennan, "The Proximity Fuze: Whose Brainchild?," U.S. Naval Institute Proceedings (1968) 94#9 pp 72–78. ^ Septimus H. Paul (2000). 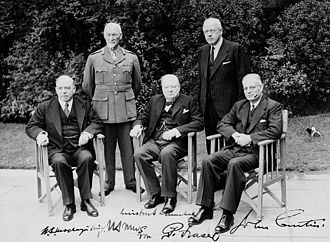 Nuclear Rivals: Anglo-American Atomic Relations, 1941–1952. Ohio State U.P. pp. 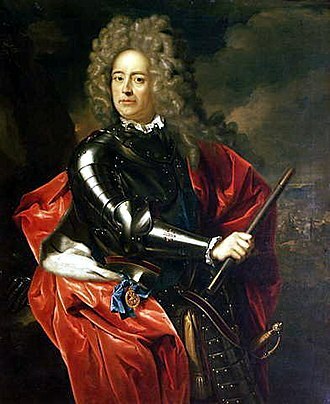 1–5. ^ Baldwin, Ralph B. The Deadly Fuze: Secret Weapon of World War II, pp. 4-6, 11, 50, 279, Presidio Press, San Rafael, California, 1980. ISBN 978-0-89141-087-4. ^ Angela Hind (February 5, 2007). "Briefcase 'that changed the world'". BBC News. Retrieved 2007-08-16. 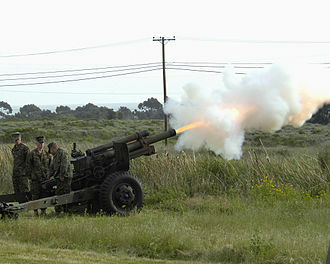 The 105 mm M2A1 howitzer was a howitzer developed and used by the United States. 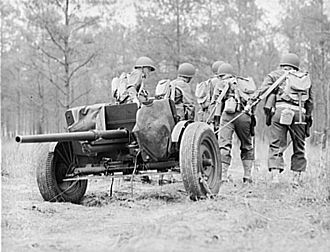 It was the standard U. S. light field howitzer in World War II, entering production in 1941, it quickly gained a reputation for accuracy and a powerful punch. 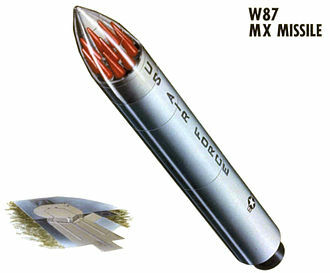 The M101A1 fired 105-millimetre high explosive semi-fixed ammunition and had a range of 11,270 metres, all of these qualities of the weapon, along with its widespread production, led to its adoption by many countries after the war. 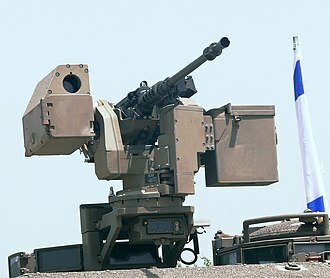 Its ammunition type became the standard for foreign countries models. During the Second World War, U. S. artillery regiments consisted of an HQ detachment, one 155mm artillery battalion, both the 155mm and 105mm battalions had twelve guns each, divided into three batteries of four guns. That gave each regiment a total of twelve 155mm howitzers, with an HE M1 shell fired at 9000 meters, the probable error in range was 41 meters, while the probable error in line was 10 meters. The U. S. military artillery designation system was changed in 1962, the gun continued to see service in the Korean and Vietnam Wars. Though a similar model, the M102 howitzer, shared the roles in battle. Today, the M101A1 has been retired by the U. S. military, though it continues to see service with many other countries. 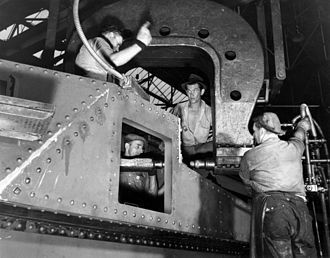 By the end of the Second World War,8,536 105mm towed howitzers had been built and post-war production continued at Rock Island Arsenal until 1953, by which time 10,202 had been built. The Canadian Forces continued to use the M2A1 as the C2 Howitzer until 1997, the changes include a longer barrel, a muzzle brake, reinforced trails and the removal of shield flaps. It remains the standard light howitzer of Canadian Forces Reserve units, the C3 is used by Reserve units in Glacier National Park in British Columbia as a means of avalanche control. In addition, the M101 has found a use in the U. S. as an avalanche control gun. Today upgraded M2A1 howitzers are still being used by the Peoples Army of Vietnam and it continues to remain as the primary tactical field-howitzer of the VPA. 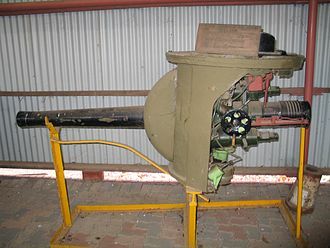 M2 Howitzers are still in limited service in the Australian Army Reserve, in regular service they were replaced by the 105mm L119 Hamel gun and the 155-millimetre M198 howitzers. Starting before the Manhattan Project in the United States, the British efforts were kept classified and as such had to be referred to by code even within the highest circles of government. 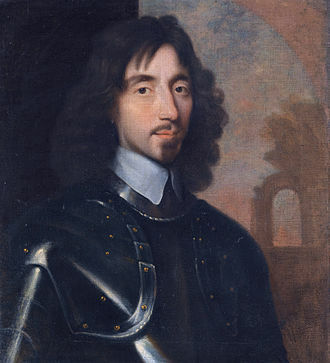 The possibility of weapons was acknowledged early in the war. 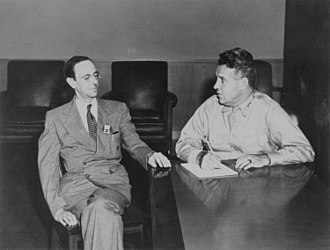 This led to the formation of the MAUD Committee, which called for an effort to develop nuclear weapons. Wallace Akers, who oversaw the project, chose the deliberately misleading name Tube Alloys and his Tube Alloys Directorate was part of the Department of Scientific and Industrial Research. 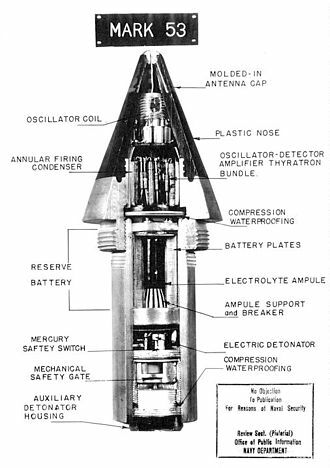 The Tube Alloys programme in Britain and Canada was the first nuclear weapons project, due to the high costs, and the fact that Britain was fighting a war within bombing range of its enemies, Tube Alloys was ultimately subsumed into the Manhattan Project. 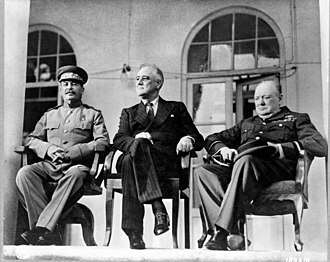 The Soviet Union gained valuable information through its spies, who had infiltrated both the British and American projects. 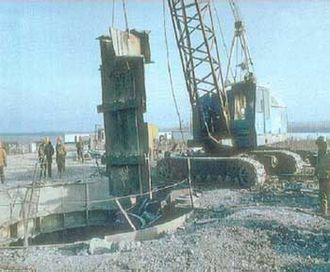 The United States terminated co-operation after the war ended and this prompted the United Kingdom to launch its own project, High Explosive Research. Production facilities were established and British scientists continued their work under the auspices of an independent British programme, finally in 1952, Britain performed a nuclear test under codename Operation Hurricane. In December 1938, Otto Hahn and Fritz Strassmann conducted experiments in Hahns laboratory in Berlin-Dahlem that involved bombarding uranium with slowed neutrons and they discovered that barium had been produced, and therefore that the uranium nucleus had been split. 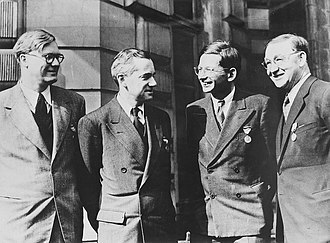 Atoms had been split before, by John Cockcroft and Ernest Walton at the Cavendish Laboratory at the University of Cambridge in 1932, the neutron had been discovered by James Chadwick at Cavendish only in 1932. 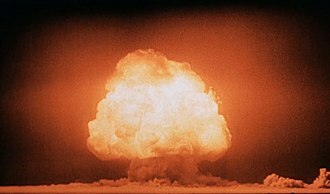 Experiments with bombardment of elements by slow neutrons had always produced heavier elements and this phenomenon was a new type of nuclear disintegration and was radioactively more powerful than ever seen before. Frisch and Meitner calculated this energy released by each disintegration to be approximately 200,000,000 electron volts, by analogy with the division of biological cells, they named this process fission. 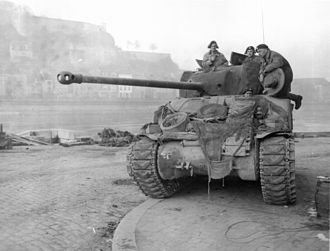 The Sherman Firefly was a tank used by the United Kingdom and some Commonwealth and Allied armoured formations in the Second World War. It was based on the US M4 Sherman, but fitted with the powerful 3-inch calibre British 17-pounder anti-tank gun as its main weapon. 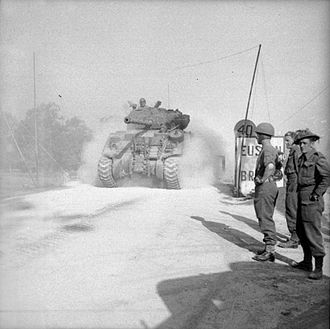 Originally conceived as a stopgap until future British tank designs came into service, though the British expected to have their own new tank models developed soon, British Major George Brighty championed the already rejected idea of mounting the 17-pounder in the existing Sherman. 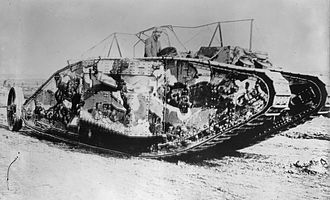 With the help of Lieutenant Colonel Witheridge, and despite official disapproval and this proved fortunate, as both the Challenger and Cromwell tank designs experienced difficulties and delays. 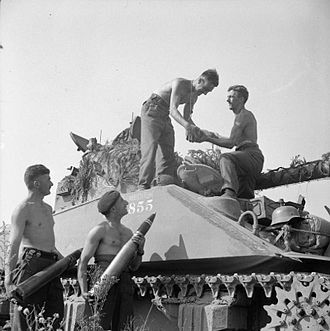 After the difficult problem of getting the gun to fit in the Shermans turret was solved by W. G. K. Kilbourn, a Vickers engineer, the Firefly was put into production in early 1944 and it soon became highly valued as its gun could almost always penetrate the armor of the Panther and Tiger tanks it faced in Normandy. In recognition of this, German tank and anti-tank gun crews were instructed to attack Fireflies first, between 2,100 and 2,200 were manufactured before production wound down in 1945. The idea of fitting a 17-pounder gun into a Sherman tank had initially rejected by the Ministry of Supplys Tank Decision Board. Although the British Army had made use of the American-built Sherman tank. The second was the A30 Challenger, which was based on the Cromwell, several unofficial attempts were made to upgun the Sherman. 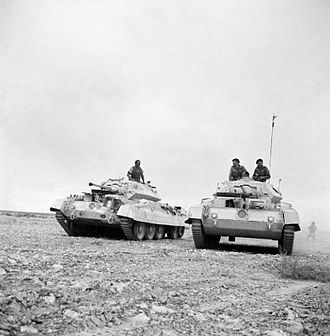 The earliest attempt can be credited to Major George Brighty of the Royal Tank Regiment while he was at Lulworth Armoured Fighting School in early 1943, despite the A30 Challenger undergoing initial trials at Lulworth, Brighty was convinced that the Sherman was a better mount for the 17-pounder. 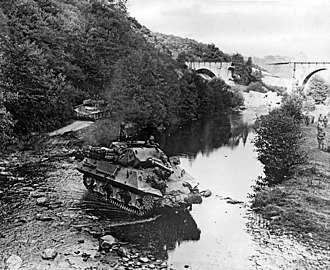 However, he was limited by the turret of the Sherman, around June 1943, a colleague of Brighty, Lieutenant Colonel George Witheridge of the Royal Tank Regiment, arrived at Lulworth. During the disastrous Battle of Gazala in mid-1942, Witheridge had been out of his Grant tank. The 75mm Pack Howitzer M1 was an artillery piece used by the United States. It was designed in the 1920s to meet a need for a howitzer that could be moved across difficult terrain, the gun and carriage was designed so that it could be broken down into several pieces to be carried by pack animals. 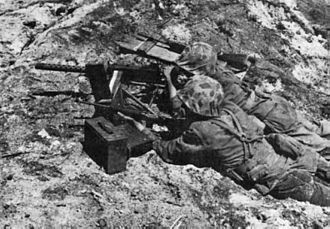 The gun saw combat in World War II with the United States Army, with US Marine Corps, in addition to the pack / air portable configuration, the gun was mounted on a conventional carriage to serve as a field artillery piece. The M2 and M3 are derived vehicle mounted howitzers used in the 75mm HMC M8, in addition, the M1 in its original version was mated to a number of other self-propelled carriages, though only one of those – 75mm HMC T30 – reached mass production. The 75 mm pack howitzer was designed in the United States in the 1920s to meet a need for a piece that could be moved across difficult terrain. In August 1927, the weapon was standardized as Howitzer, due to meager funding, production rates were low, by 1940, only 91 pieces were manufactured. It was not until September 1940 that the howitzer was put into mass production, by then, the M1 had been succeeded by the slightly modified M1A1. The only significant changes during the production period were carriage improvements. The original carriage M1 was of box type, with wooden wheels. The requirement for a lightweight howitzer for airborne troops led to the introduction of the M8 carriage, another requirement, from the cavalry branch of the US Army, resulted in a completely different family of field howitzer split trail carriages M3A1 / M3A2 / M3A3. However, only limited numbers of the M1 field howitzer variant were built, the howitzer M1 or M1A1 consisted of tube and breech, which were joined together by interrupted threads, allowing for quick assembly and disassembly. 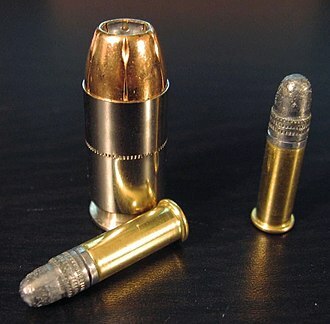 One eighth of a turn was required to connect or disconnect tube, the tube had uniform, right hand rifling with one turn in 20 calibers. The breech was of horizontal sliding type, with continuous-pull firing mechanism. A jet engine is a reaction engine discharging a fast-moving jet that generates thrust by jet propulsion. This broad definition includes airbreathing jet engines and non-airbreathing jet engines, in general, jet engines are combustion engines. In common parlance, the jet engine loosely refers to an internal combustion airbreathing jet engine. These typically feature an air compressor powered by a turbine. Jet aircraft use such engines for long-distance travel, early jet aircraft used turbojet engines which were relatively inefficient for subsonic flight. Modern subsonic jet aircraft usually use more complex high-bypass turbofan engines and these engines offer high speed and greater fuel efficiency than piston and propeller aeroengines over long distances. Jet engines date back to the invention of the aeolipile before the first century AD and this device directed steam power through two nozzles to cause a sphere to spin rapidly on its axis. So far as is known, it did not supply mechanical power, instead, it was seen as a curiosity. However, although powerful, at reasonable flight speeds rockets are very inefficient. The earliest attempts at airbreathing jet engines were hybrid designs in which a power source first compressed air. In one such system, called a thermojet by Secondo Campini but more commonly, examples of this type of design were the Caproni Campini N.1, and the Japanese Tsu-11 engine intended to power Ohka kamikaze planes towards the end of World War II. None were entirely successful and the N.1 ended up being slower than the design with a traditional engine. If aircraft performance were ever to increase beyond such a barrier and this was the motivation behind the development of the gas turbine engine, commonly called a jet engine. The key to a jet engine was the gas turbine. The gas turbine was not an idea developed in the 1930s, the first gas turbine to successfully run self-sustaining was built in 1903 by Norwegian engineer Ægidius Elling. Limitations in design and practical engineering and metallurgy prevented such engines reaching manufacture, the main problems were safety, weight and, sustained operation. 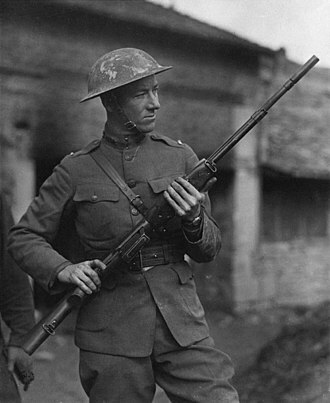 Numerically, it was the main rifle used by the American Expeditionary Forces in Europe during World War I. The Danish Slædepatruljen Sirius still use the M1917 as their service weapon, before World War I, the British had the Short Magazine Lee–Enfield as their main rifle. Compared to the German Mausers or U. S.1903 Springfield, the starting point was to copy many of the features of the Mauser system. 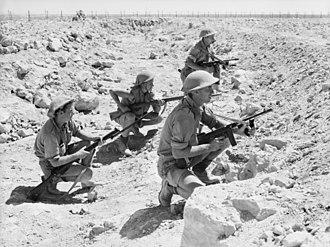 The rifle was developed at the Royal Small Arms Factory at Enfield in the United Kingdom. This development, named the Pattern 1913 Enfield or P13, included a front locking, dual lug bolt action with Mauser type claw extractor as well as a new, powerful rimless.276 Enfield cartridge. The design carried over a Lee–Enfield type safety at the rear of the action, an advanced design of aperture rearsight and a long sight radius were incorporated to maximize accuracy potential. Ease of manufacture was an important criterion, the onset of World War I came too quickly for the UK to put it into production before the new cartridge could be perfected, as it suffered from overheating in rapid fire and bore fouling. As it entered World War I, the UK had an urgent need for rifles and they decided to ask these companies to produce the new rifle design in the old.303 British chambering for convenience of ammunition logistics. The new rifle was termed the Pattern 14, in the case of the P14 rifle and Remington were selected. A third manufacturer, Eddystone Arsenal – a subsidiary of Remington – was tooled up at the Baldwin Locomotive Works in Eddystone, three variations of the P14 and M1917 exist, labeled Winchester and Eddystone. When the U. S. entered the war, it had a similar need for rifles, the Enfield design was well-suited to the. 30-06 Springfield, it was a big, strong action and was originally intended to employ a long, rimless bottlenecked cartridge. Eddystone made 1,181,908 rifles – more than the production of Remington, the standardized production effort regarding parts interchangeability did not work out as intended. Winchester produced slightly differing parts, leading to interchangeability issues with the Remington, the markings were changed to reflect the model and caliber change. A16. 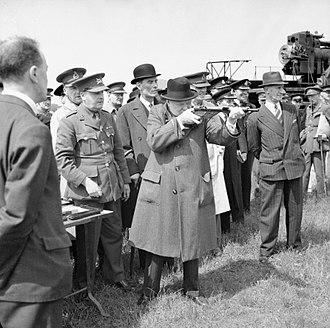 Winston Churchill with a Sten Mk II in Shoeburyness on 13 June 1941. 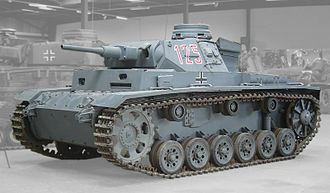 A Sten Mk II held in the Polish Home Army Museum, Kraków, Poland. 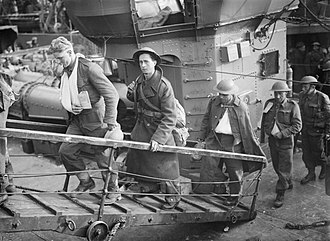 British paratroopers in Oosterbeek during Operation Market Garden armed with the Sten Mk V.
75 mm howitzer of the 1st Airlanding Light Artillery Regiment in action in Italy. 75 mm pack howitzer on carriage M1, supplied to Chinese forces. M3 on display at Fort Sam Houston, Texas. Manhandling a gun into position during training at Fort Benning, 1942. Note the raised wheel segments. 37mm Gun M5, as mounted in Light Tank M2A4. 3 inch M5 pulled by a halftrack. M5 near Vielsalm, Belgium, 23 December 1944.